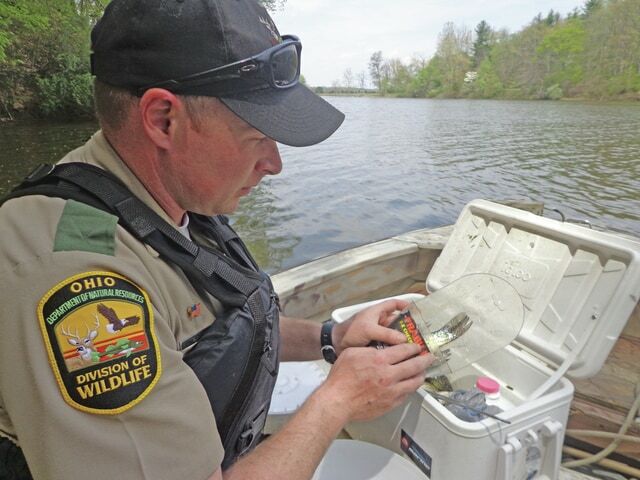 Scott Cartright, an Ohio Division of Wildlife officer assigned to Adams County, measures a fish at Rocky Fork Lake. It’s hard to believe that almost half the year has already passed by. It was only weeks ago we were wondering if the weather was going to repeat itself like the past three springs, with cool damp weather conditions and plenty of rain. But then things started changing in mid April and so did the fishing opportunities at Rocky Fork and Paint Creek lakes. Prior to the 2015 spring warm up, wildlife officers pulled out patrol boats from winter storage and prepared them for use. Gas lines, storage tanks, and watercraft safety equipment were inspected and repaired in anticipation for the spring spawn and subsequent increase in fishing pressure within this time frame. With the consistent weather patterns, the lakes’ temperatures started to rise, thus causing the fish to react. Fishermen were catching both crappie and saugeye in sizes and numbers that were both impressive and concerning. Wildlife officers had been waiting for this opportunity for several weeks, and were soon launching patrol boats to conduct fishing license and live well inspections. From the beginning, most fishermen were cordial and more than willing to allow wildlife officers to look at their licenses and live wells for specie specific regulations concerning size and possession of fish. It wasn’t long though before officers started finding violations. On one particular inspection, the fishermen were found in possession of 35 crappie, five fish over the daily bag limit of 30. On a different inspection, five short Saugeye were found that ranged from 12-14 inches, under the 15-inch minimum. As time allowed and officers were available, other patrols continued from mid April to after the Memorial Day holiday. For that six-week time period, state wildlife officers contacted over 200 fishermen and conducted live well inspections of watercraft on the lakes as well as at launch ramps. A lot of fishermen were commenting on all the fish they were catching, but most were undersized and were released back into the lakes. It will be interesting this summer to see how a lot of those undersize saugeye that were 13-14 inches grow. The next time frame for hitting a lot these fish will be in the fall. Wildlife violations discovered during the inspections included over bagging of crappie, undersize crappie, undersize saugeye, no fishing license, stream litter, and other natural resource related violations. Once the holiday weekend arrived, much of the fishing success was slowing down due to the continual warm-up of the lakes themselves. Now, even though the weather continues to cycle up and down between seasonal and unseasonably cool temperatures, for the most part fishing success now will be centered around dawn and dusk times for crappie and saugeye, including bass species. Shovel head catfish is now turning on throughout both lakes with the summer temperatures as well. Wildlife officers balanced the sport fishing enforcement while the spring wild turkey season was underway. As most turkey hunters know, the 2015 spring season was a challenge and struggle. Most hunters have commented they heard few birds and saw smaller flocks this spring. From their observations it appears in some areas of Highland County that bird populations are lower this spring. Observations from throughout the county indicate flocks of three to six birds, where in those same areas hunters advised they were seeing eight to 12 birds in the local flocks. Lower populations could be attributed to the last three springs of heavy rains and cool weather, which caused many nests to fail or be abandoned by hens as reports indicating this came in. Renesting and late hatches were observed very late. Before the spring of 2015, Toms were observed in June and July during those wet years still strutting around with hens in fields and places where the nests had apparently failed. The flocks were adapting the best they could for a successful hatch in those summers. The good news this year is that the weather has been more accommodating for successful hatches. Reports are coming already regarding turkey poults being observed with the hens throughout the county. The Division of Wildlife monitors wild turkey and grouse poult populations through observations from the public. Anyone that observes turkey or grouse poults can go online at wildohio.gov and record the observations by clicking on the scrolling tab on the home page. You can also call 1-800-wildlife to report those observations. Jim Carnes is a wildlife officer in Highland County with the ODNR Division of Wildlife.